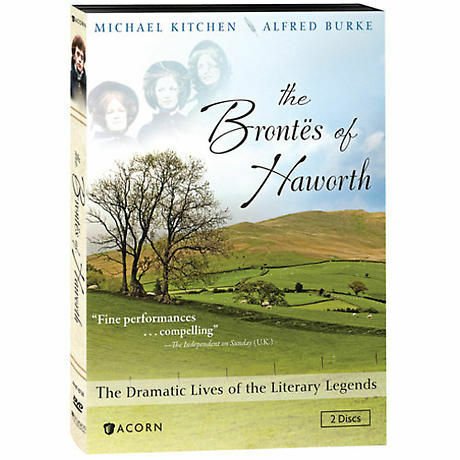 Siblings Charlotte, Branwell, Emily, and Anne Brontë experienced soaring artistic achievements and personal tragedies. This finely crafted British miniseries follows England's most accomplished literary family from their sheltered childhoods to their complex lives as adults. Written by poet and playwright Christopher Fry; with Michael Kitchen (Foyle's War) and Barbara Leigh- Hunt (Pride and Prejudice). 5 episodes, 4 hrs 20 min, 2 DVDs, SDH. The comfortable childhood shared by Charlotte, Emily, Anne, and Branwell Brontë instills in them boundless creativity and a passion for learning. But their sheltered upbringing creates difficulties as each makes his or her way into the world beyond the moors. Branwell finds his artistic hopes dashed and makes a painful decision, while Charlotte and Emily further their education in Brussels. Anne faces challenges as the governess of a wealthy family, and a cholera epidemic strikes back home with tragic consequences. As Mr. Brontë's health fades, his daughters find success in crafting their stories, and Charlotte publishes a book of poems. Branwell's self-destructive behavior takes a turn for the worse, reducing him to a shadow of his once-brilliant self. The year 1847 brings excitement for the sisters with the publication of their novels and a life-changing voyage to London to prove to their publisher that each sister is an author in her own right. But sorrowful events soon overshadow the glow of success. Charlotte's wide acclaim as an author brings her father much pleasure, and her quiet life takes a surprising turn when she receives a marriage proposal. In the end, however, Mr. Brontë suffers the most mournful existence a parent can imagine: outliving all of his gifted children.